What has happened to the comedy crowds these days? Can you tell me that? I don't know what it is, but I just can't seem to connect at all with the average audience. Seriously, folks, what is the problem here? I've been doing this a whole lot longer than any of the clowns out on the circuit these days, so I think I know a thing or two about my craft by this point. These kids coming up now, they wouldn't know funny if you spelled it out for them with a 22-page Translator's Foreword in a special edition from Oxford University Press. Even my best gags get little more than a blank look these days. It's like the average audience member never heard a friggin' parabasis before in their life. Let's get one thing straight: I know humor. In my day, I killed up and down both sides of the Aegean. You should have seen me at the amphitheater of the Great Theatre of Dionysus, under the slope of the Acropolis—now that was a comedy venue. By the nine Muses, the benches were packed and the wine was flowing—and so were the laughs! Call me crazy, but comedy just has not been the same since the Macedonians took over and banned all the best Old Attic theater back at the end of the fourth century B.C.E. It's not that my material isn't strong. Come on! You don't win competitions at both the City Dionysia and the Lenea if you don't know how to work a room. Yet people only seem to like that Adam Sandler and Jim Carrey baloney. Lowest-common-denominator nonsense. You think anyone's going to remember Larry The Cable Guy in 2500 years? Whatever happened to standards? Audiences nowadays are so used to being spoon-fed the most simplistic material, they don't recognize good comedy anymore. You can read them stasimon after stasimon of the funniest chanted poetry ever, and they still sit there like so much stone statuary at the Oracle of Delphi. What do I gotta do, beg? Or how about including the Cheans in the ritual prayers the Birds offer to the gods? That used to have them splitting their sides! Now they're like "Cheans who?" Man, I miss the glory days of classic comedy, in the years directly preceding and at the very start of the Peloponnesian War. You know what it is? It's these young people, they don't have the attention spans audiences used to. Try getting one of them to sit through a five-day festival of Dionysus. I guarantee the little punk will be squirming in his seat and checking his computerized text messages before the end of Day One, and that's in the middle of a Bacchic frenzy. They all want the same thing: stale jokes from some untutored hack—not the kind of serious stuff that's performed outdoors with a full masked chorus and lasts an entire afternoon. If it weren't for regional community theater and the occasional academic conference for a bunch of bluehairs, you'd never even know I was one of history's most profound and influential comedic geniuses. I can't even get in the door at Caroline's! Don't people like impersonations anymore? 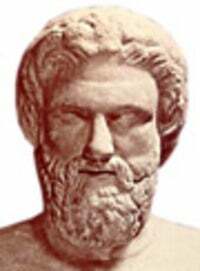 I used to do the best Euripides. I had his whole pretentious, "look-at-me-I'm-the-most-important-tragedian-in-the-history-of-the-city-state" thing down—I swear, you'd think the guy was sitting right across the agora from you. But whenever I bust that one out now, they stare at me with this look on their faces like they've just been sentenced to drink hemlock. And it's not that I'm a prude, mind you. I can work as blue as the best of them. Take the enormous prop phalluses in Lysistrata, for example. Talk about "A" material. But even the most accessible stuff, like my Origin of Love bit from the Symposium, bombs miserably with today's crowd. Doesn't anybody appreciate a good Cleon-bashing monologue these days? Look, I don't have to get on my knees like some chump, okay? I'm Aristophanes of Athens, for Poseidon's sake. I worked with all the classic guys! Plato wrote verses praising me. In my day, I was tops, I was… aw, forget it. Comedy's a tough gig, man.